AMHARA REGION, 3 April 2014- Tena (meaning health in Amharic) Esubalew, 25, and Eneayehu Beyene, 27, are the heroines of Delma kebele as they have become the health confidants of the community. Delma Kebele (sub district), which is located in Machakel woreda (district) in the Amhara Region in northwest Ethiopia. Delma is a community 10 kilo meter from an asphalt road with a population of 4,733. As part of the EU funded Africa Nutrition Security Project (ANSP), UNICEF launched a community health programme (2012-2015) in 20 districts across three regions of Ethiopia to help the Government boost the nutritional status of children under two in communities like Delma where child malnutrition has been alarmingly high. Key to the programme’s success has been the role of community Health Extension Workers (HEWs). From Delma, Tena and Eneayehu have received intensive training with the support from UNICEF on nutrition so they can effectively carry out health extension duties. 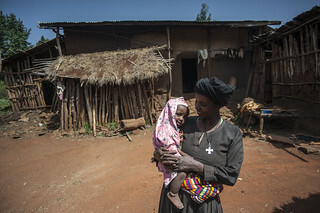 Eneayehu and Tena spend most of their days walking between households in Delma, visiting young mothers in the community and engaging them about the importance of child nutrition. They are trained to identify mild and moderate malnutrition and also growth faltering – based on which they provide age-tailored counselling. Additionally, they can diagnose if a child has Severe Acute Malnutrition (SAM) with or without complications. If a child is suffering from SAM with complications then the health extension workers will quickly have them referred to a health centre in the nearest town. The health post where Tena and Eneayehu work is situated on top of a hill surrounded by open fields and grazing livestock. It is a busy hub frequented by the community’s young mothers, who are eager to learn about their children’s health status. The walls are plastered with graphs charting the health and development of the community’s under-five children. It is here that growth monitoring of all the community’s children under-two-years is conducted on a monthly basis and compared with World Health Organisation growth standards. Yideneku Aynalem, 38, reaches up to a mud shelf in her hut and retrieves an illustrated booklet. “This is a very important document”, she says carefully opening the page to reveal a colourful chart. The HEWs have distributed the materials printed with the support of UNICEF throughout the community to enable lactating mothers to track their child’s weight. Yideneku points to a graph and traces with her finger a green upward curve signifying the trajectory of a healthy child’s development based on optimum height and weight measurements. She explains with a smile how her 10 month old child Barkelegn Walelign’s growth has started to correlate with the green line on the chart. “I have been given the knowledge and it is now my responsibility to keep putting this learning into action so that my child can remain strong and healthy”, she says. Yidenku’s child is one of 270 children under-two years of age that have benefited from the EU-UNICEF supported package of high impact interventions in Delma. The community results are encouraging: the rate of underweight young children has reduced from six per cent to one per cent in two years. “At the start of the programme, six children in the village were diagnosed with Severe Acute Malnutrition (SAM) – this year only two children suffered this extreme health condition”, says, Tena. HAROJILA FULASO, OROMIA REGION, 1 February 2014 – “The health extension worker told us to wash our hands with soap and if we don’t have soap, we can use ashes. So, when I have not been able to buy soap, this is what we use to disinfect our hands”. Ms Shure Gore takes the can of ashes and hands it to United Nations Deputy Secretary-General Mr Jan Eliasson. He gently takes out some of the greyish substance and rubs it before rinsing it off with the water from the jerry can attached to the tree, next to the family’s’ latrine. “My hands are clean,” he exclaims while the family is observing his actions closely. The model family is the approach adapted by the Health Extension Programme to improve household practices. After 96 hours of training and adopting 12 of the 16 packages, a family graduates to become a so-called model family. The health extension package is categorised under three major areas and one cross cutting area: namely Hygiene and environmental sanitation; family health services; disease prevention and control; and health education and communication. The Lemma-Buchule family, in which Ms Shure Gore is the driving force, has a latrine with hand washing facilities and dry and liquid waste disposal pits. In addition, the household has adequate aeration and light and the animals are kept separate from the living area – to name a few requirements of becoming a model household. The family lives a couple of minutes walk away from the health post. Ms Abebech Desalegn is one of the two health extension workers running the facility. The health post provides services to 736 households and 3,532 inhabitants – ensuring that health care is delivered at the doorstep. “I know Shure and her family very well,” says Ababech. “The family consists of 10 members, including eight children between the ages of 3 and 22 years old. They come here when they need vaccine, a new mosquito net or when they are ill.” She has assisted the household in reaching the status of “model household”. “They now inspire others to do just like them, they are an example to the community,” Ababech explains. Ababech is a government salaried and trained health worker, under the Health Extension Programme, an innovative community based programme which started in 2003. To date, 38,000 health extension workers have been deployed in nearly all rural villages. The programme aims to create a healthy environment and healthy living by delivering essential health services to communities. 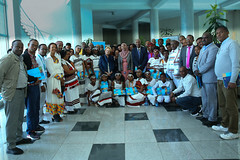 UNICEF supports the Health Extension Programme in different dimensions. Training of HEWs to improve their technical competencies in delivering health and nutrition services, procuring and distributing of vaccines, medicines and supplies, ensuring availability of job aids at health posts, have all led to increased coverage of health and nutrition services at community level. In addition to prevention and health promotion services, health extension workers are also now involved in case management of pneumonia, diarrhoea and severe acute malnutrition in more than 90 percent of health posts. The Deputy Secretary-General, Mr Jan Eliasson studies the charts on the wall of the small health post. “You are doing an excellent job here,” he says while impressed with the statistics and service delivery provided by this health extension post. 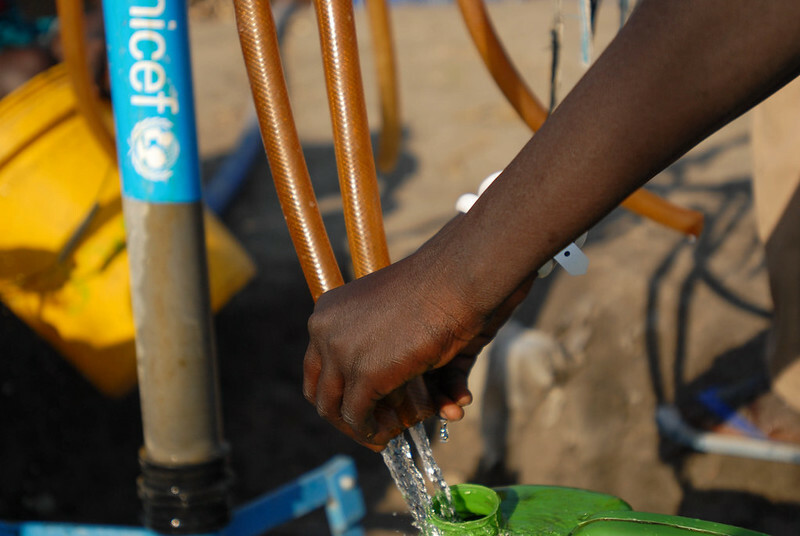 To date, UNICEF has provided a total of 160 health posts with a complete WASH package. This includes: providing capacity in the design of WASH facilities, construction of water supply and sanitation facilities and hygiene promotion to health institutions through construction and disseminating information on hygiene and environmental sanitation. In addition, WASH interventions at the health post level include: the provision of a hand-washing stand; a septic tank; incinerator; placenta pits; general solid waste and sharp pits. Ethiopia has been an active participant in the Sanitation and Water for All Partnership. In 2013, the Ethiopian Government, with support from UNICEF, was able to establish a Sector-wide Approach termed the ONE WASH National Programme with a dedicated budget line for sanitation in the Government of Ethiopia’s treasury. Although good progress is underway in the area of water, sanitation and hygiene, still some challenges remain. In 2010, out of a population of over 80 million, about 46 million were without access to improved water supply and sanitation and Ethiopia had the highest number of people (38 million) practicing open defecation among African countries. The lack of access to adequate clean drinking water and sanitation services has a dramatic impact on the lives of people, especially women and girls, and undermines efforts to improve health, nutrition and education outcomes. Mr Jan Eliasson underlines the need for clean water and sanitation. “We really must act now. We have to talk about sanitation and improving access to toilets and clean water. We also must change attitudes and behaviours,” he emphasises with passion. 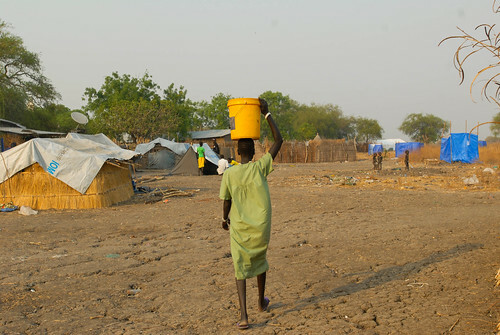 DAASANACH, Southern Nations, Nationalities, and People’s Region (SNNPR), 18 December 2013 – Omorate village in South Omo Zone of the SNNPR is a semi-arid area where the Daasanach tribes live. Their houses are dome-shaped made from a frame of branches, covered with hides and patch works. These houses are scattered along the site where the Omo River delta enters Lake Turkana of Kenya. Most tribes in South Omo are pastoralists. In Omorate too, the people’s lives are bound to the fate of their herds of cattle, sheep and goats that they raise. Children play a critical role in the pastoralist lifestyle. Boys as young as 6 years old start to herd their family’s sheep and goats, while girls marry very young so parents get additional livestock through dowry. Therefore, parents do not send their children to school. In the Daasanach tribe, education is considered as a luxury. For teachers of Alkatekach Primary School this is their biggest challenge. They use the Alternative Basic Education (ABE) system to cater for the need of the children. The Alternative Basic Education system responds to the urgent need for an education that suits the special needs and constraints of pastoral life. It provides flexible school hours, allowing pastoral children fulfil their household responsibilities of herding cattle to find water and pastures while still finding time for school. Located five kilometers from Omorate town of Kuraz district, the Alkatekach Primary school has only 79 registered students for the 2013/2014 academic year and the highest grade these students can reach is fourth grade. This is because there are no classes set up above the fourth grade. 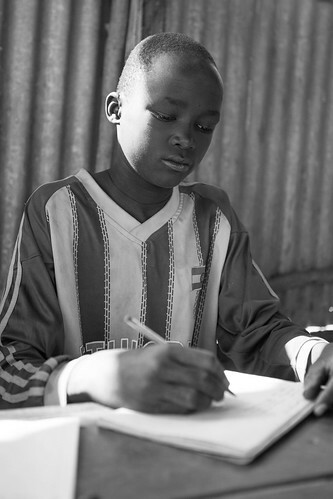 14 years old Temesegen Koshme is a third grade student in Alkatekach Primary School. He is sitting in a class exercising the conversion formula for different measurements. His favorite subjects are mathematics and social science. Unlike Temesgen, children his age are taking care of family cattle or are married off. “I prefer coming to school than looking after my parents’ cattle. Alkatekach is where I grasp knowledge,” says Temesgen, “When I go to school in the morning my brother and sister look after the cattle. After school, I go straight to the field to take over”. Temesgen’s parents told him that his younger sister is waiting to be married off, “I tried to explain that she has to come to school, but they did not listen to me” says Temesgen concerned about his sister’s future. 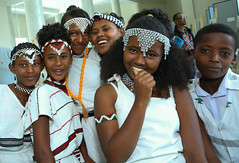 Temesgen is one of the lucky ones to be enrolled this year. For him school is his happiest place. Agure Amite, a father of twelve, living in Omorate village, sends two of his children to Alkatekach Primary School. 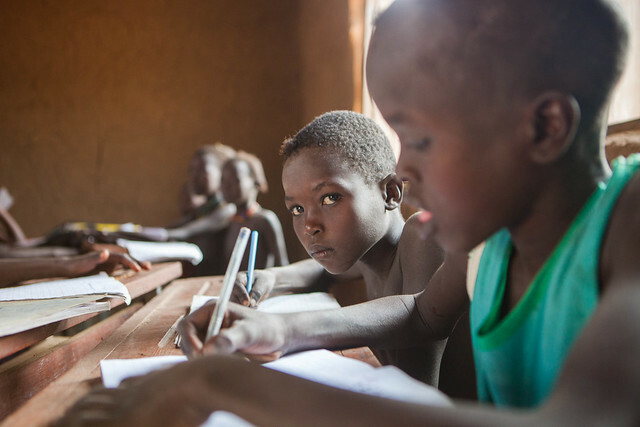 When asked why the others do not go to school he says, “Some of them have to look after my cattle and others are not ready for school because they are below 10 years old.” Some parents in the Daasanach tribe send their children to school when they reach age 10. However, nationally children start school at age 7. 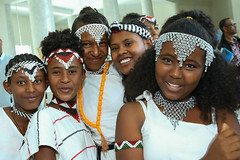 The 2012 study on situation of out of school children in Ethiopia shows that SNNPR has 46.5% of out of school children making it the third highest region after Oromia (49.2%) and Amhara (48.7%). With the support of UNICEF and the generous donation of US$240, 000 received from ING the Daasanach tribe now has ABE centers close to in their area. In addition to the construction of ABE centers, ING’s support also helped to provide furniture, training for ABE facilitators and education materials to pastoralist and economically disadvantaged children. For Meseret and her colleagues at the Alkatekach Primary School, this means increasing the schools capacity up to sixth grade means that children like Temesgen will be able to receive education within their community for the next two years. DERA DISTRICT: AMHARA REGION, 30 October, 2013 – It is early Thursday morning and Gibtsawit Health Post, found in a rural village of Gibtsawit Mariam located 42 kilometres from Bahirdar, is busy with patients. The small room is crowded with mothers who are there to check their babies’ growth; pregnant women having their antenatal care and men and women of the community who are receiving malaria treatment. 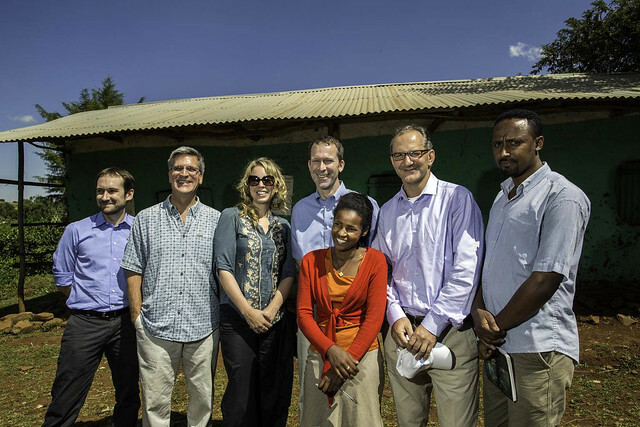 Today is a special day, because the health extension workers of the health post are welcoming Mr Paul Rochon, Deputy Minister of International Development, Foreign Affairs, Trade and Development Canada (DFATD) and Dr Peter Salama, UNICEF Representative to Ethiopia. Misa Wondimagegn, a 25 year old health extension worker, supports the community in Gibtsawit village of Dera district with curative and preventative health and nutrition services. Misa and her colleagues Meseret and Hagere are supported by the health development army (a network of one volunteer to five Households) attend the 13,366 population of the kebele. Growth Monitoring and Promotion is the cornerstone in the Community Based Nutrition Programme. It creates a platform for the health extension workers to contact the caregivers and check the nutritional status of children, detect growth faltering at early stage and provide counselling on Infant and Young Child Feeding practices (IYCF). “Now, the situation has changed a lot: we have mothers who bring their children for check-up and pregnant women who come for antenatal care. The support we get from UNICEF and the Canadian Government has increased the variety of treatments we provide for the community. We have outpatient treatment for children diagnosed with severe acute malnutrition and for pregnant women we give antenatal care and supply iron –folate. We promote good Hygiene and sanitation and we also give treatment for common childhood illnesses like pneumonia malaria and diarrhoea for the community,” Misa explains with smile on her face. Since 2007, the Canadian Government has been supporting UNICEF Ethiopia’s interventions in Child Survival with Vitamin A and Zinc Supplementation and Integrated Health System Strengthening as well as routine immunization. Dera is one of the 100 UNICEF supported districts implementing the preventive and curative nutrition interventions. It is implementing Community Based Nutrition (CBN), integrated with other Community Maternal New-born and Child Health Interventions (CMNCH) to prevent child malnutrition, focusing on the first 1000 days: the time between conception and when a child turns two years of age. In August 2013, 1,247 children attended the monthly Growth Monitoring and Promotion session in Dera enabling Misa and the other 78 health extension workers in the district to identify nutritional status of the children, detect early growth faltering, help the caregivers visualize the status and counsel them on appropriate age specific feeding messages using the Family Health Card as a counselling aid and refer children for further care in a timely manner whenever needed. 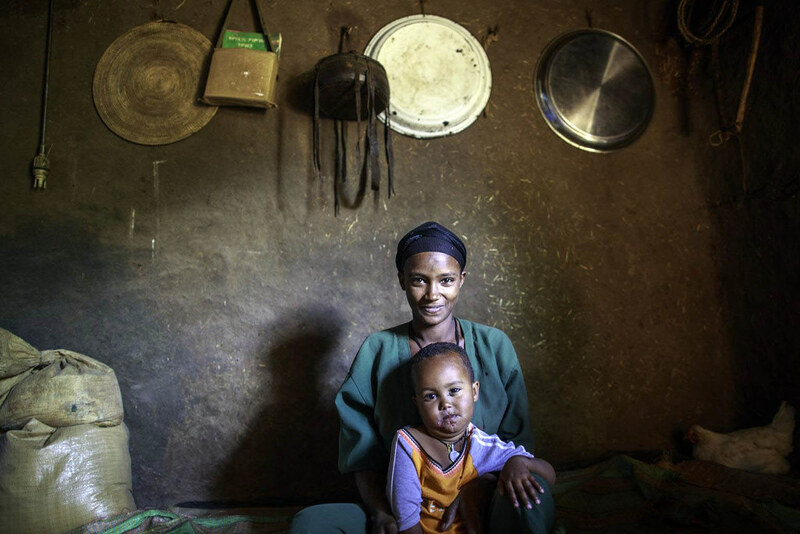 Haimanot Andarge, a 20 year old mother of baby girl Azeb, is one of the many mothers in the district who got follow ups from Misa and her colleagues during their pregnancy. “Misa used to come to my house regularly ever since she knew I was pregnant. She gave me vaccines and other supplements which was important for my baby. And when my labour began my husband took me to the health post. Misa encouraged me to deliver at Hamusit Health Centre which referred me to Bahirdar Hospital in time as my delivery was complicated. My baby was delivered safely because the health post was in our village to identify my condition,” Haimanot remembered. Her eyes reflect her fear of what might have happened. “ Azeb, is going to be two this year and Misa still follows up on her regularly and gives me advice on what to feed her,” adds Haimanot. 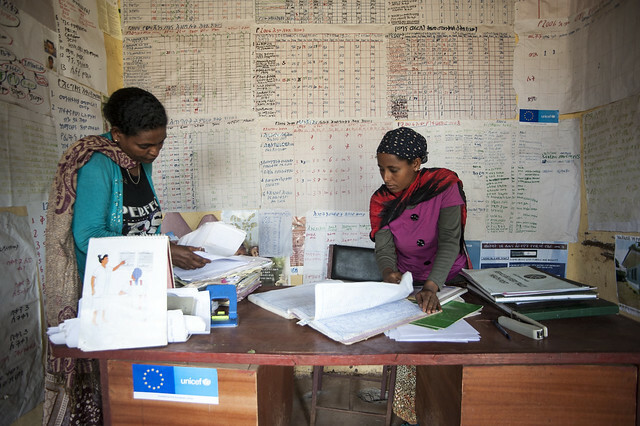 With the integrated multisectoral approach of the government of Ethiopia and the support of UNICEF and partners such as DFATD, the hard work of health extension workers like Misa and colleagues is paying off. The support from UNICEF and the Canada Government that started the preventive nutrition programme of Community Based Nutrition linked with provision of WASH facilities has helped reduce the number of children who are malnourished. According to Dr. Peter Salama, the collaborative work of all stake holders, the availability of treating health posts within the community have made saving a child easier than ever before. At the end of the visit the team eagerly waits to hear from Misa and her colleagues on their response to the fundamental question of how many children were lost to malnutrition recently. “There were 27 children diagnosed with Severe Acute malnutrition in July 2012- August 2013. They were treated with the Out-patient Therapeutic Programme (OTP) and 20 have been cured and seven are still on follow up with good prognosis but we have not lost a single child,” Misa explained boastfully. “It was not easy to change the attitude of the community. When we started, there was no one before us working with the community reaching every household door to door. We started from nothing. But with the support of donors like UNICEF and the Canadian Government, I cannot even remember the last time a child died in the community for the last four years,” Misa reminisces. “It makes me realise that it was not for nothing that I worked so hard at the beginning. I have brought change in my community.” Misa concludes.